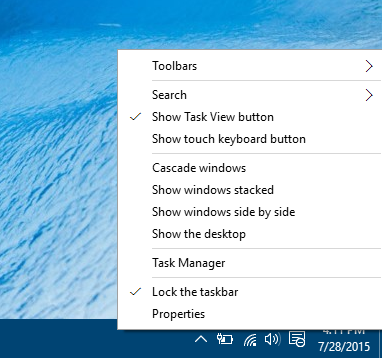 In Windows 10 you can keep taskbar in one place by locking it, which can prevent accidental moving or resizing. You can also enable auto-hide for taskbar to create more screen space when you are not using it. 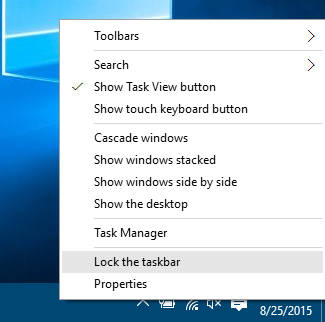 Right click on taskbar and select "Lock the taskbar" in context menu. 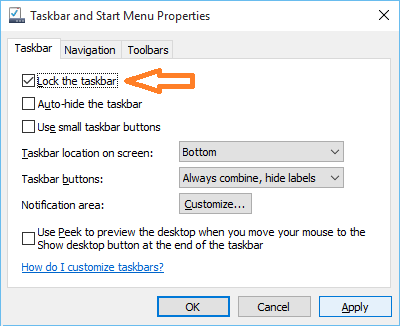 In "Taskbar and Start menu Properties" window, select check box in front of "Lock the taskbar" option. Click on Apply button to save the change. In "Taskbar and Start menu Properties" window, select check box in front of "Auto-hide the taskbar" option. Click on Apply button to save the change. 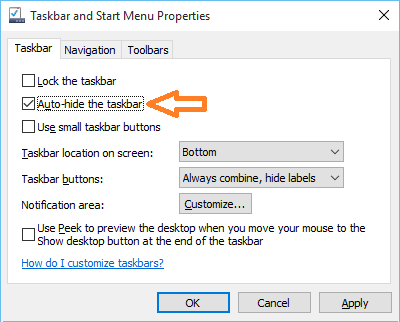 You can turn off auto-hide taskbar by unchecking "Auto-hide the taskbar" check box. When taskbar is hidden, you can hover near bottom of screen to make it visible.